The June 27 hearing on Whole Woman's Health v. Hellerstedt affects women across the entire country, but especially in Texas. 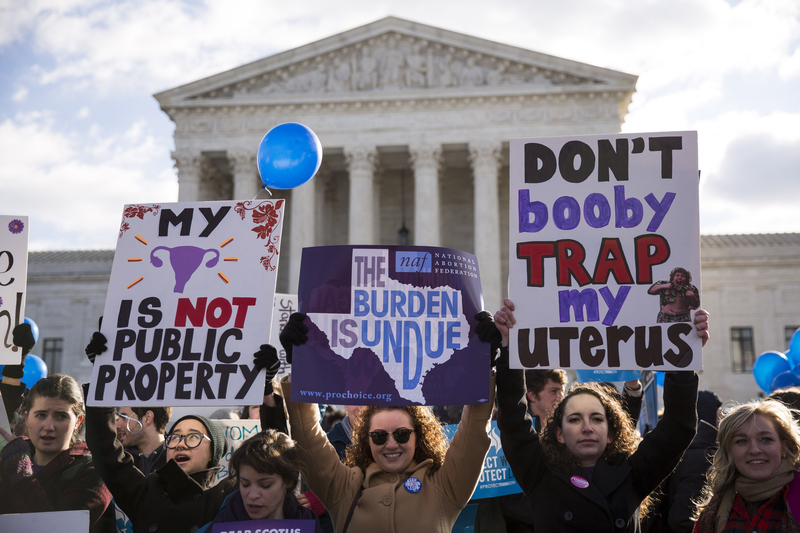 The SCOTUS case reevaluated House Bill 2 (HB2), which was a 2013 bill that placed restrictions on abortion providers, ultimately making it more difficult for women to access legal abortions. So how will the SCOTUS abortion decision affect Texas? There are millions of women in the Lone Star State alone who will be severely impacted by the court's ruling on this monumental case. Back in 2013, there were four restrictions placed on abortion because of HB2. These restrictions, which were passed by Texas state legislature, included requiring a physician to have admitting privileges at a hospital within 30 miles of the abortion clinic site; banning abortions after 20 weeks of pregnancy; banning use of the abortion pill; and requiring all abortion clinics meet the standards of ambulatory surgical centers (ASCs). The Whole Woman's Health ruling affects Texas in a fairly simple, yet significant way by addressing two of these restrictions: Texas will become a state that will either have a fewer number of total abortion clinics because they will have to meet the strict ASC requirements of HB2, or they will have a greater number of modest abortion clinics that will be easily accessible by most women throughout the state. Moreover, Whole Woman's Health directly affects Texas in both the number of available abortion clinics and abortion providers. By eliminating the requirement that these providers must have admitting privileges at hospitals within a 30-mile radius of the abortion clinic, physicians will be able to provide a safe and legal procedure for women without meeting an additional requirement. Many abortion clinics rely on visiting physicians who can't obtain admitting privileges at local hospitals — not because of quality of care, but because local, institutional laws. For example, in Florida, visiting physicians have to apply and pay to obtain admitting privileges at local hospitals, and those privileges typically expire after one year and can take more than two weeks to receive. And there's another obstacle facing abortion providers who are required, under HB2, to have medical privileges at local hospitals: Often, especially in conservative areas of Texas, the surrounding hospitals have a religious affiliation and can deny these providers admitting privileges if their religious ideology is anti-abortion. Perhaps most striking about the ways in which Whole Woman's Health will affect Texas is on the number of abortion clinics. There are approximately 5.4 million women of reproductive age in Texas. In 2013, there were 42 abortion clinics serving these millions of women. Now, there are 19 clinics remaining. Whole Woman's Health has the ability to make it so that there are only 10 abortion clinics in the state of Texas because of ASC requirements. In a massive state that is 790 miles long and 660 miles wide, Texas women would be in danger if there were only 10 abortion clinics providing safe and legal abortions. And all of these clinics will reportedly be located in the state's four largest metropolitan areas, none west of San Antonio, The Atlantic reported. If you suddenly had at least 10,000 ... women who have to travel 150 miles to get their abortions, are there going to be more women or fewer women who die of complications?